Millenium is a comic book store in Montreal, Quebec that specializes in american, french canadian and french comic books. Our expertise incited us to make a website to make our products accessible online and to offer competitive prices. The comic book is an archetype of American culture that's as iconic as apple pie and baseball. But if there's one industry that's lent itself to export, it's this one. 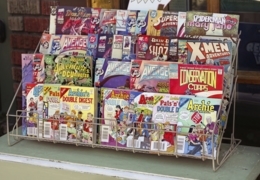 Indeed, since the second half of the 20th century, the comic book has not only captured the imagination of generations of readers, young and old, but it has also managed to carve out a niche in the consumer habits of fans throughout the world. Formerly published almost entirely serially and on a regular basis, comics have remained alive and well in the 21st century, especially at Montreal's Librairie Millénnium. This comics store is right in the heart of the Plateau. It's a specialist in French Canadian, French-language European and American comics, with an impressive stock, searchable via the website's database. Millennium Comics should be of particular interest to Francophones looking for European titles such as Thorgal, the Belgian fantasy series that has links to the Golden Age Tintin series.